After opting for a slower train so my boyfriend could take full advantage of his EuRail pass, we took a 4-hour, scenic trip from Florence to Rome, and arrive in the afternoon, ready to go out and see Roma. This is actually my second trip to this city. The last time I was there was in 2011, and although I liked Rome, I think the tiredness from traveling around Europe for a week made my overall impression of it not as good as it could've been. 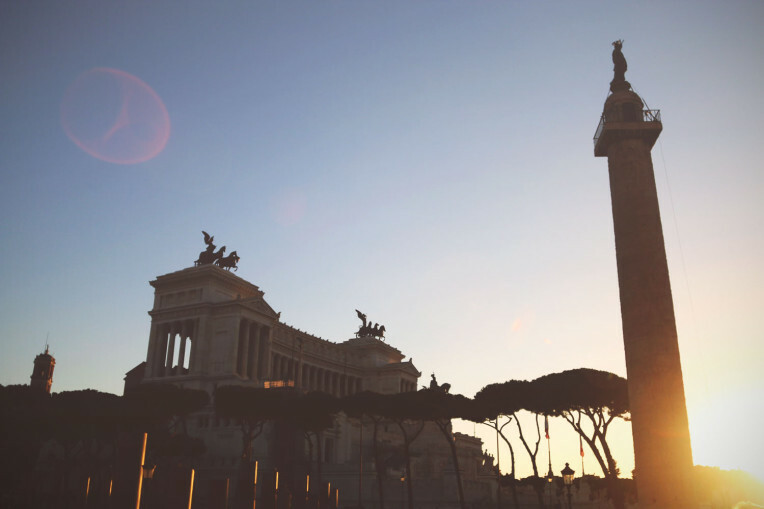 But second time's the charm for this journey, because I very much enjoyed Rome this time! Levi and I walked around for as long as we could with our tired feet, until we had to head to our accommodation for the night. It was nearing the golden hour, so the streets were lit up with sun as it fell behind the horizon. We stopped to get some dinner around 6pm, ate some pasta, and then headed back out into the night. We walked to the Trevi Fountain, which I was sad to see was under major construction, so much so that the water wasn't running and it was practically all covered in metal rods and fabric. At least I'd seen it before, uncovered and thriving. We were so tired and had no idea how long it would take to walk to our B&B that we grabbed a taxi and had it take us to where we were staying. It was a bit pricey, but for us confused tourists who don't speak Italian, we didn't feel comfortable walking around all night, trying to find a bus that would take us there. We arrived at the place to check in, and were greeted nicely by our host. I wasn't sure what to expect from the listing, but it was cheap, so that's why I chose it. And I'm glad I did. It was in this lovely building with a vintage elevator that took us up to the third floor, where there were two rooms inside an apartment, made-over to be a bed and breakfast. Not only was our room huge and we had our own bathroom, there was also breakfast included in our stay. The way they set out everything was so cute and it was perfect to fall into bed and then be able to wake up and go feed ourselves with the selection of cereal, toast and coffee. After having stayed in a few different AirBnb locations now, I am so fully in love with that way of accommodation that I might never use a hostel again! After a great nights sleep and stuffing ourselves full of the free breakfast, we headed to The Vatican to see St. Peter's Basilica and the Vatican Museum. Everywhere were people trying to sell us stuff to skip the line. We were content with not paying extra for that, so we got in line to go inside the Basilica, which look less than 30 minutes, saw the beautiful and regal inside, and then went around the corner to the museum. That's when we understood why they were trying to get us to skip the line. It took us three hours to get inside. The first hour and a half of that was standing in the very hot sun, and then we turned the corner to be in the shade, but still were stuck in a never-moving line. I'd been inside before, so I was okay with not going in, but I didn't want Levi to miss out on it, so I persisted and we finally made it inside. It's not really my kind of museum. Just a lot of religious relics and statues. I was happy though, to go inside the Sistine Chapel again and sneak a photo of Michelangelo's artwork on the ceiling. The rest of the day was seeing the other sights that Rome has to offer, such as the Colosseum, the Pantheon, Piazza Navona and anything else along the way. I was just happy to be back here again, and to enjoy it a lot more this time. Rome is a very beautiful city, and even all the street sellers, trying to make me buy their mobile phone long-handled selfie contraption wasn't enough to bother me. It was weirdly less annoying than it was in Paris. Perhaps because hearing them walk up to you and say, "Selfie?" is funny and endearing in a way. The (non)perfect ending to my trip was missing my flight the next morning and having to rebook for one 6 hours later, which wasn't ideal, but I'm trying not to be too negative about it, because it definitely didn't ruin my trip. I still had a wonderful time in spite of it, and hope to enjoy the beauty and ancientness of Rome more in the future!